cooking from the books on my shelf and other stuff too! 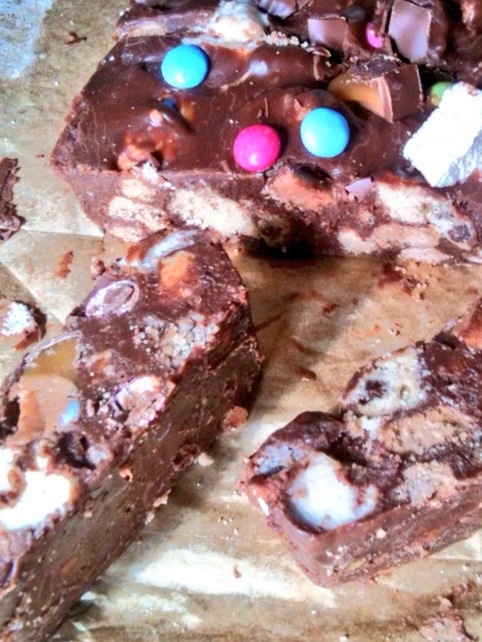 How to Make Rockin’ Rocky Road! I recently posted on Twitter about Rocky Road and got a few comments, seems people love Rocky Road(a wee bit of internet snooping revealed that it is in fact an Australian food creation! Invented to sell on confections that had spoiled! Who knew?). 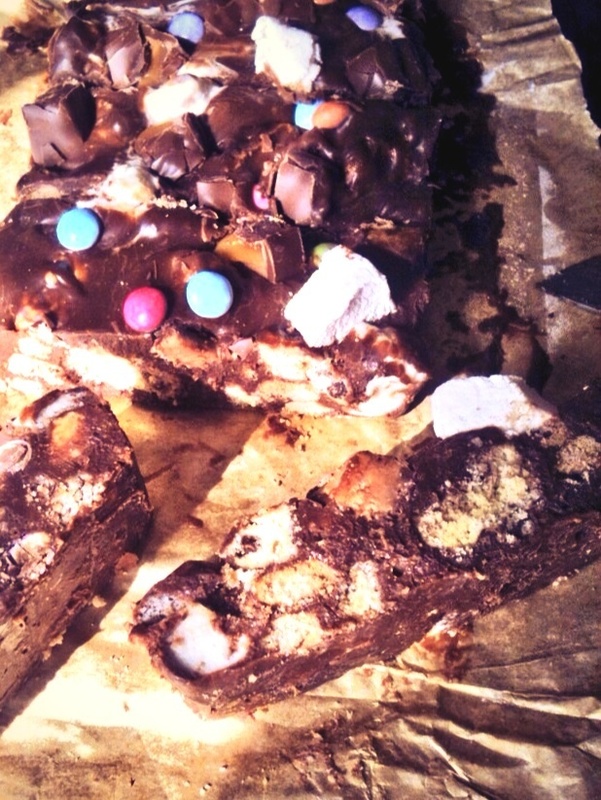 Rocky Road is, in this house, the ultimate chocolate overload. A bar/cake/sweetie thing so awesome my boys only request it every now and then for the fear of “over doing” it and making themselves sick of the decadent treat. This is my original recipe, pretty dark and “adult” in taste, but you can lighten it up by swapping out some dark for milk chocolate. I did this recently and made a tray bake of 150g milk to 50g dark choc and reduced the condensed milk to 3/4 tin and butter to 1oz. If you do go with a much higher percentage of milk(or in fact ALL milk) just remember to adjust the butter and condensed milk also! 12-15 ish biscuits (I used Border Biscuits Chocolate Chip Shortbread, but you could use any other biscuit as long as you’d be happy to eat it plain, without all the chocolate etc you may use it here) crushed, not finely, we want chunks not dust! Put chocolates, condensed milk, syrup and butter in pan. Heat on low until melted and glossy. Take a little of the biscuits, Mars bars, mallows and fruit and put in small bowl, to pretty up the top. Pour into a foil-lined(or cling film or parchment would be fine also) tray, loaf tin or cake tin and leave to set. Cut into slices, squares or wedges. 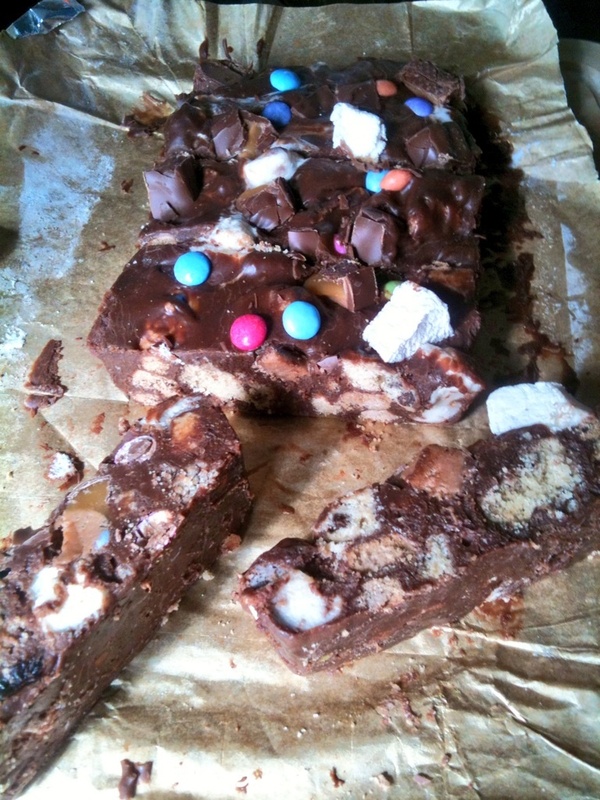 I love Rocky Road and make a mint version with matchmakers. Great flavour and they add a lovely gritty texture with biscuit and marshmallows! Crazy Good Hot Chocolate Mix!